BScrollBars are different from other views in one important respect: All their drawing and event handling is carried out within the Application Server, not in the application. A BScrollBar object doesn't receive Draw() or MouseDown() notifications; the server intercepts updates and interface messages that would otherwise be reported to the BScrollBar and handles them itself. As the user moves the knob on a scroll bar or presses a scroll arrow, the Application Server continuously refreshes the scroll bar's image on-screen and informs the application with a steady stream of B_VALUE_CHANGED messages. The window dispatches these messages by calling the BScrollBar's ValueChanged() function. Each function call notifies the BScrollBar of a change in its value and, consequently, of a need to scroll the target view. Confining the update mechanism for scroll bars to the Application Server limits the volume of communication between the application and server and enhances the efficiency of scrolling. The application's messages to the server can concentrate on updating the target view as its contents are being scrolled, rather than on updating the scroll bars themselves. A scroll bar's value determines what the target view displays. 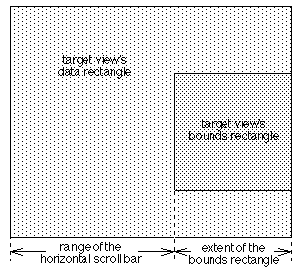 The assumption is that the left coordinate value of the target view's bounds rectangle should match the value of the horizontal scroll bar, and the top of the target view's bounds rectangle should match the value of the vertical scroll bar. When a BScrollBar is notified of a change of value (through ValueChanged()), it calls the target view's ScrollTo() function to put the new value at the left or top of the bounds rectangle. The value reported in a ValueChanged() notification and passed to ScrollTo() depends on where the user moves the scroll bar's knob and on the range of values the scroll bar represents. The range is first set in the BScrollBar constructor and can be modified by the SetRange() function. What the target view can draw may change from time to time as the user adds or deletes data. As this happens, the range of the scroll bar should be updated with the SetRange() function. The range may also need to be recalculated when the target view is resized. Scroll bars control the target view, but a target can also be scrolled without the intervention of its scroll bars (by calling ScrollTo() or ScrollBy() directly). Therefore, not only must a scroll bar know about its target, but a target view must know about its scroll bars. When a BScrollBar sets its target, the target BView is notified and records the identity of the BScrollBar. The two objects communicate whenever the display changes: When the scroll bar is the instrument that initiates scrolling, ValueChanged() calls the target view's ScrollTo() function. To cover cases of target-initiated scrolling, ScrollTo() calls the BScrollBar's SetValue() function so that the scroll bars can be updated on-screen. SetValue() in turn calls ValueChanged(), which makes sure the exchange of function calls doesn't get too circular. Whether the knob should be a fixed size, or whether it should grow and shrink to proportionally represent how much of a document (how much of the data rectangle) is visible within the target view. A proportional knob is the default. Whether double, bidirectional scroll arrows should appear on each end of the scroll bar, or whether each end should have only a single, unidirectional arrow. Double arrows are the default. Which of three patterns should appear on the knob. What the size of the knob should be—the minimum length of a proportional knob or the fixed length of a knob that's not proportional. The default length is 15 pixels. When this class constructs a new BScrollBar, it conforms the object to the choices the user has made.